Rosacea literally means “small rose flowers”- this is a skin complaint of the face and is an unexplained origin, which manifests itself as blotchy, sometimes scaly redness as well as inflamed pustules and papules. A course of IPL treatment will greatly reduce redness giving a more even skin tone. Eliminate facial redness to give an all over even skin complexion. A deposit may be required to secure your booking. How do I know I have rosacea? Early symptoms of Rosacea; as it first develops, Rosacea may appear to come and go on its own. Pimples of Rosacea appear on the face as small, red bumps, some of which may contain pus. These may be accompanied by the development of many tiny blood vessels on the surface of the skin and persistent redness of the face. When the skin doesn’t return to its normal color and other symptoms, such as pimples and enlarged blood vessels become visible, it’s best to seek advice from a physician. The condition rarely reverses itself and may last for years. It can become worse without effective treatment. Who is at risk for Rosacea? Those most likely to develop Rosacea are fair-skinned adults, especially women, between the ages of 30 and 50, although it may effect men or women of any age and even children. It is not known why women get Rosacea more often than men, though some cases of this disorder have been associated with menopause. 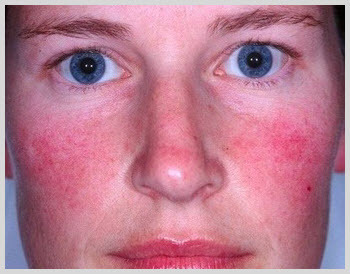 Rosacea usually develops over a long period of time. It may first seem like a tendency to blush easily, a ruddy complexion, or an extreme sensitivity to cosmetics. An occasional embarrassment or tense moment may also trigger flushing. Rosacea can be treated very successfully, with Avant Aeshetics IPL.